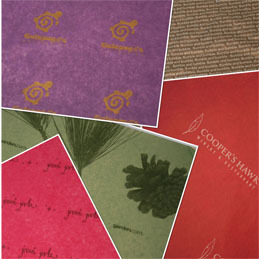 Custom printed recycled white and kraft tissue with minimums as low as 10 packages(480 sheets per package). Colored tissue contains 10% PCR and up to 60% post industrial waste with print minimums of 20 packages. All printing is done with water based inks. White and kraft tissue made with virgin fibers is also available. Follow the link below to view the sustainable manufacturing processes practiced by our tissue manufacturer, Seaman Paper. For more information, call us today at 800-323-1609 or e-mail us at info@howardpkg.com . White and Natural Kraft Tissue Paper. Printed 1 and 2 Color Scatterprint Design. Minimums start at 10 reams. Special sizes and put ups available. 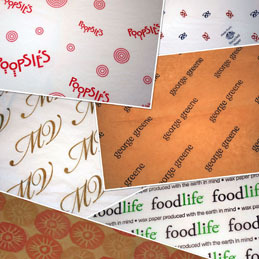 Colored custom printed tissue paper. Printed 1 or 2 color scatterprint design. Minimums start at 20 reams. More than 50 tissue colors available. Special put ups and sizesavailable.